Decorate your nails in style this Eid. Take a look at a few gorgeous nail art designs that can be easily tried at home. To make it even more easy for you, we bring a step to step guide! Eid is just around the corner, and it’s time to deck yourself up for the festivities. Pick up a set of new dresses and shoes, stock up on mehndi cones and lastly buy some interesting nail colors for fantastic Eid special nail art. Mix and match colors with glitter and embellishments to create fun styles which are sure to catch everyone’s eyes when you step out for the celebrations. 1. Crescent moon design: Start by painting your nails with a clear base coat. This will ensure that the nail color lasts longer. Then apply a coat of green nail polish and let it dry completely. Next, take a toothpick and dip it into some white nail polish. Carefully draw a crescent shaped moon and star on alternate finger nails. Once it has dried completely apply another coat of clear nail polish to seal the pattern. 2. Sparkling French tips: Apply a base coat of clear nail polish to start with. 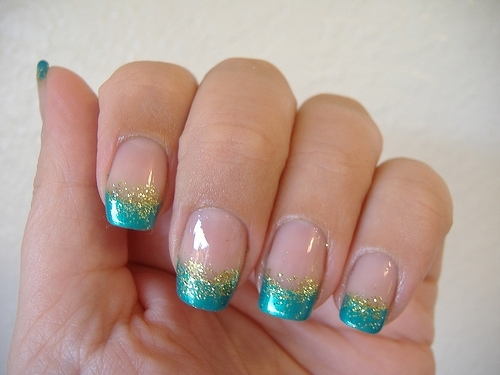 Then apply nail paint to the tips of your nails for a French manicure, just substitute the color with a vibrant green. 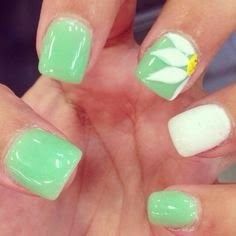 After it has dried completely, dip a paint brush in a little bit of gold sparkle or glitter nail polish and draw it over the line separating the green tip from the clear part of the nail. Finish it off with another coat of clear nail polish to help the color settle. 3. Fiery red: Add some sizzle to your style with fiery red nails this Eid. After applying a coat of a striking red color, swipe some gold sparkle across the top of the nail, but be careful to use it sparingly or else you will lose the effect of the red. Next, use a delicate, thin brush (like an eyeliner brush) and draw asymmetrical lines from one top corner across the nail to the bottom. Get creative with the patterns and get ready to show off your nails. 4. Embellished nails: Follow the same method as a French manicure. 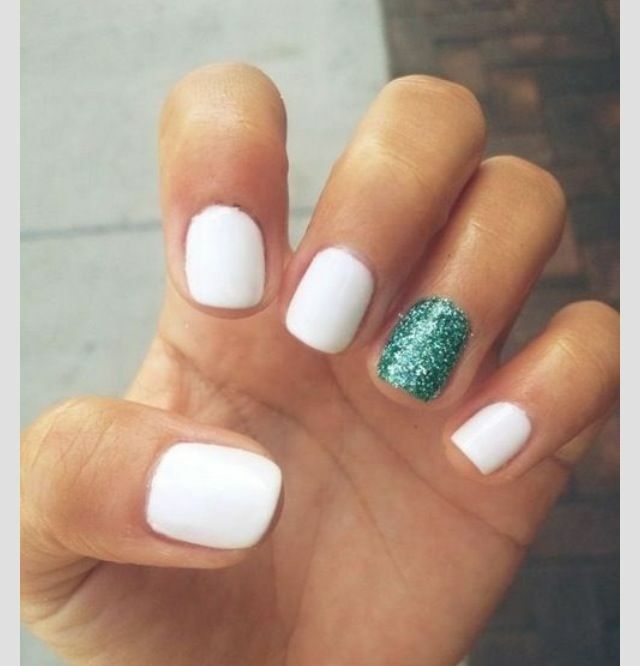 You can do the regular French manicure with white or opt for green tips as you prefer. 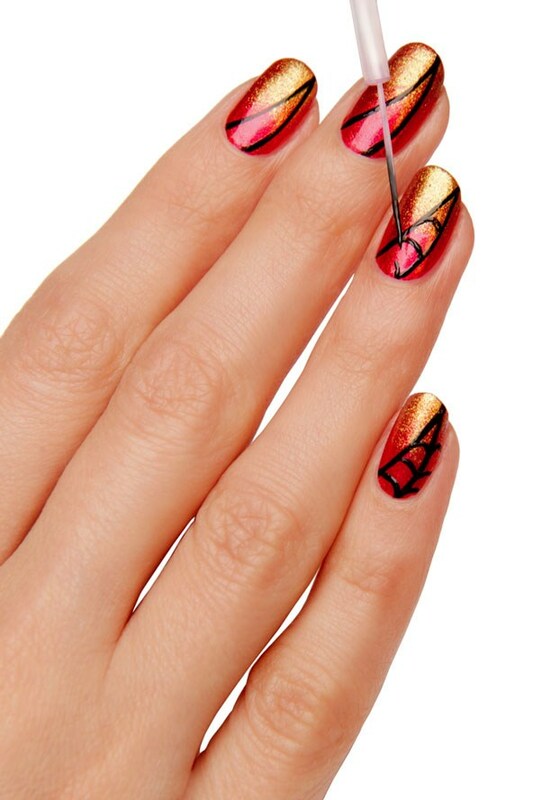 Then use contrasting colored embellishments like nail stickers or sequins and apply them along the manicure line. You can even add a dot of sparkle or glitter at the base of the nail to add a little oomph to the look. 5. Glittery matte: This is one of the simplest nail art styles you can try. All you need is some clear nail polish and a bottle of glitter in the color of your choice. After applying a coat of clear nail polish, just dip your finger into the bottle of the glitter so that it can completely coat your nails. Let it dry and then flaunt your fabulous fashion. 6. Floral fiesta: Clean your nails thoroughly and file them to the desired shape. 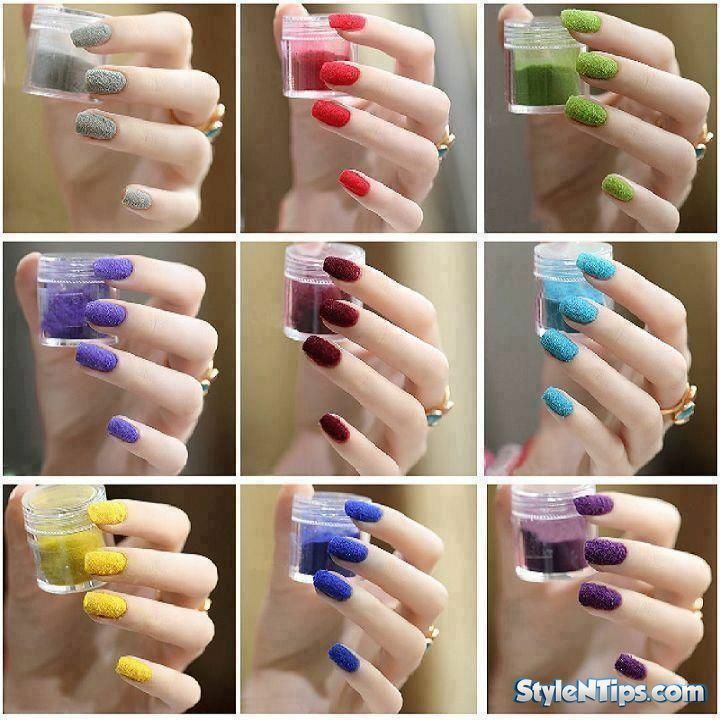 Paint your nails with the color you want and let them dry. Then using a toothpick draw an outline of flower petals in the corner of one or two nails with white nail polish. Use a thin brush to fill up the outlines and then draw a yellow dot at the base of the petals to give it a nice, floral effect. Finish up with a coat of clear nail polish. 7. Glam and glittery: If a clean and minimalist style is what you are looking for, then this is a wonderful option for you. Paint your nails with a basic white color, but leave one fingernail unpainted. Apply a coat of clear nail polish on this fingernail and dip it into a contrasting color of glitter. Let it dry and you have an amazing and innovative style to show off this Eid.